I’m pleased to welcome Ashley Lloyd Smith today, author of the rather splendidly named Pizza with Jimbob & Twoforks. He’s answering a few questions about himself and his work. 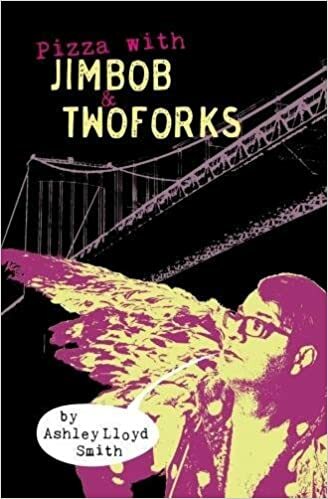 Liquorice Fish, which is an imprint of Cinnamon Press, releases Pizza with Jimbob & Twoforks on September the 3rd. It is a dark comedy about a man who kills his wife, instantly regrets it, and searches for salvation in the oddest places. Ashley’s background is in theatre; writing, directing and acting. His plays have been performed on three continents. He has written over a hundred micro stories (seventy words or less), half a dozen children’s novels and a number of short stories which he performs around the East Midlands. His second novel is close to completion. Some boring town, somewhere in Britain! I could say that it’s simply Derby, my home town, which is a place I love by the way, but there is a bit of Bristol in my head and Basingstoke. The bit with the over excited vomiting children in Legoland got cut though! Loads of children’s authors I could blame for that, in particular Ivan Southall the Australian genius and his Hills End, but as an adult I’d have to say Sam Shepard, the recently deceased Hollywood actor and playwright. At university I read a lot of plays because of my degree in Drama. Strindberg and Ibsen were favourites, but Shepard showed what could be done with small moments of action that could have a ricochet impact on a reader. I think everything he did had a hint of Samuel Beckett in it, so you’ll find with my writing all has a hint of Shepard. I’d like to be able to write like Rushdie or Kundera but if I ever get compared to Shepard I’ll be happy! When I was young I was put off writing by those disclaimers at the end of films etc. “Any similarity to anyone living or dead is purely co-incidental” I thought every idea magically came into existence through will and imagination alone. I’ve always had a big imagination, I was a child in a world of his own for much of the time, but try as I might there would be no complete original invention that wasn’t similar to something. When I realised that these disclaimer were just legal speak and not reality I started writing everything I saw. Sometimes it changed, sometimes it was perfect as its self, exactly as I had witnessed or experienced it. Sometimes I take the situation or the characters and I twist a new direction, opposite to expectation, opposite to how I am myself. I write any thoughts that come and then go back, sometimes years later, and see if I can’t turn them into something that people would want to read. Holidays are good places for creativity. More time and new experiences. Try something new when you are stuck. I have a great example of something a writer I knew tried to get inspiration, but I’m not telling you here what that was! What would you change about the novel? I should say, “Nothing! It’s perfect!” but I know that after I’ve finished directing a play I often go back to it in my head and change some detail that’s been frustrating me. Just reimagining it in my head. Right now I’m ok with the book, but once it lands on my desk in technicolour print, I fear I will gulp at certain pages. I know right now that it could have taken another root, that an idea hinted at early on in the novel is not taken up and I wonder if I shouldn’t have run with this. But it’s done and all the real improvements go into my next novel, or the one after that. I’m all the way on to my 5th in my head! Too much! That sounds like a good thing and I am pleased to not be bereft of ideas but recently I had a writing break for a week that consisted of hours of going through a couple of dozen notebooks and lifting out every story, idea, poem that never made it on to my computer and making sure that there was this digital copy. I’m at the point now where so many of my projects need an injection of work on them that I don’t know where to start. Two full novels, (plus two in only note stage) five children’s novels, two of which are part of a worked out series, lots of poems and short stories that could do with touching up before being sent to competitions, magazines and anthologies, plus my favourite quick writing past time the micro story (50 to 70 words. I text them to people). I have about a hundred of these that I’m considering self-publishing with guest editors, to keep the interest in my writing going once my novel has been published. This summer it’s all about Zombies. I’m writing a Young Adult story about a group of women who try to rid the world of adult males by making them much more susceptible to a virus creating zombie people. It’s tale about the battle of the sexes and suddenly seems very relevant again I’m afraid. My zombies are called Men, because whether male or female they all look like men and walk like men. It’s my first book with a female central character.